A 73-year-old woman was strangulated to death and bundled in a double bed in her house at Indra Colony near the Tajpur road. Two people including a teenaged boy were murdered in cold blood by robbers who broke into a house in Muneem colony here at midnight and decamped with Rs 3 lakh in cash and a car. Two women were seriously injured in the incident. Two motorcycle borne snatchers robbed four people at different locations in the old city area in the wee hours today before the police reportedly arrested one of them. The duo is said to be behind 50 snatching incidents in the city during the past few months. After a halt of nearly two months, the income tax department has once again geared up for surveys and raids. Nearly 150 companies are on the list of the department and the proceedings have begun from today. Mandher Singh (51), who was tested positive for swine flu, died yesterday at Dayanand Medical College and Hospital. The Supreme Court’s decision to delay the high court judgment on the Babri Masjid issue till September 28 has given a much-needed breather to the police. Its concern was heightened by the fact that the verdict was due to be pronounced on Friday, the day when Muslims gather at Jama Masjid in the old city to offer ‘namaz’ (prayers). Following a sudden surge in the water level of the Sutlej last evening, the district administration has put villages located near the Garhi-Mattewara dhussi bundh on high alert. 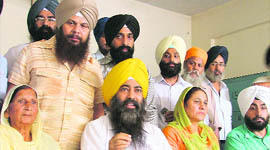 The Danga Peerit Welfare Society, Punjab, has called for implementation of the directions of the Punjab and Haryana High Court with regard to immediate allotment of residential houses/booths to victims of the 1984 anti-Sikh riots in letter and spirit. 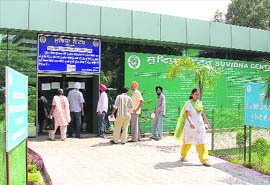 Visitors to various public offices were inconvenienced as public work was boycotted by government employees, who observed a pen-down strike under the banner of the Punjab State Ministerial Services Union here today. Ethiopian minister Mehreteab Mulugeta has said the his government will provide guarantee of life and property to those investors from India, mainly from Punjab, who invest in that country in agriculture sector. 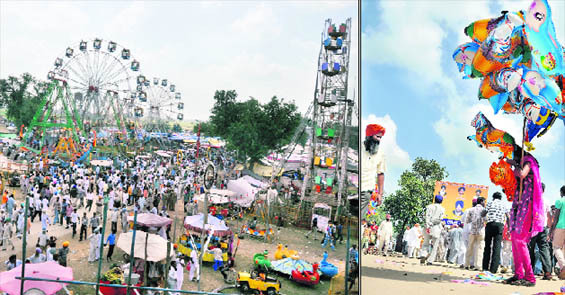 Woven in the rainbow colours of festivity, hundreds of devotees of “Naag Devta” from Malwa region offered prayers at the Guha Marhi on the concluding day of three-day Chappar Mela at Chappar village of Ludhiana district. The District Consumer Disputes Redressal Forum has ordered the owner of Wave Cinema, Westend Mall, to pay Rs 11,500 to a person whose stereo was stolen from their parking, when he went there to see a movie. 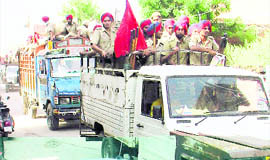 To instil sense of security and confidence among residents of the region inhabited by members of two communities waiting for the verdict on the Ayodhya case, a convoy of at least 30 vehicles carrying about 400 cops organised a flag march in localities falling under jurisdiction of Amargarh police circle. A six-day workshops “India Haat” on photography, pottery and sculpture making is being organised at International Institute of Fashion Design. The workshop will help students discover and express their individual style of creativity. Prices of commercial and waterproof plywood have gone up by 5 and 8 per cent, respectively, following an increase in the prices of raw material. Dr Jeyaraj D Pandian, professor of neurology at Christian Medical College (CMC), delivered a series of lectures in Melbourne recently. Dr Jasbir Singh Bedi, assistant professor in the department of veterinary public health of Guru Angad Dev Veterinary and Animal Sciences University, has been awarded the prestigious Commonwealth Scholarship-2010 by the Commonwealth Scholarship Commission in the UK. The Entomology Club at the PAU brought out a semi-annual newsletter-Entomology Reporter which was released by Dr Manjit Singh Kang, Vice-Chancellor, today. On the second day of Koshish Intra-Institutional Cultural Festival of Punjab College of Technical Education (PCTE), the highlight was the “best teacher” award function, in which 10 teachers from various schools of the region were selected. Dr KNS Kang, director-general, PCTE, gave away awards to teachers.